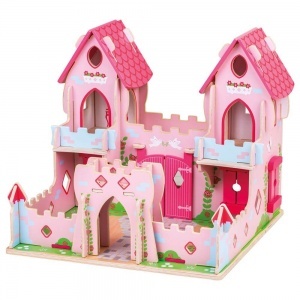 Step into a magical kingdom of imaginative play, where the beautiful Princess and charming Prince are ready to live happily ever after in their Fairy Tale Castle. This delightfully detailed wooden palace features a pretty courtyard, working shutters and doors, balconies, a dressing room and a secret door! Can you spot it? The dressing room is fit for a Queen, and guests can enjoy fantastic views of the pretty courtyard from the balcony. Removable roofing allows easy access to the upstairs rooms, and the secret door means the Princess can escape when the Witch is about! Simply slot together the wooden pieces, and the Palace is ready for some seriously royal play. There is plenty of reach-in play space with multiple play levels and an open courtyard, lots of room for friends to play too! Kids will love recreating magical moments from their favourite fairy tales. A great way to develop dexterity, imagination, social skills and coordination.